A fourth air quality management area (AMQA) has not been declared in Chichester, the council has confirmed. Three AQMas have already been designated in the city at Stockbridge, Orchard Street and St Pancras, places where air quality objectives are either being exceeded or are likely to be exceeded in the relevant year and beyond. It has been claimed in recent weeks that a fourth AQMA had been declared at Westhampnett Road due to worsening air quality, but Chichester District Council has confirmed this is not the case. In the council’s air quality annual status report dated July 2018 one of the priorities listed is to deliver a new monitoring station at Westhampnett Road which was chosen as a location ‘in order to monitor the impact of increasing traffic on the eastern side of the city’. The report goes on to describe how one of the main challenges to implement measures in the air quality action plan was ‘continuing delays to the decision on improvements to the A27 by Highways England’. 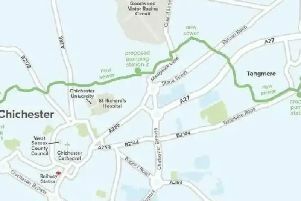 This meant that ‘there is increasing congestion on the A27 trunk road, leading to traffic diverting through Chichester with resulting impacts on local air quality in the city’.